Visually stimulating images, plus bold, clear calendar grids make eye-catching organizers of the year. GREENSBORO, N.C. - Oct. 24, 2016 - PRLog -- Grungy, color-distressed transformations of old industrial photos, vibrantly colorized renditions of vintage 1800's black-and-white Bible illustrations, visually exciting presentations of the world's greatest mathematical equations, and unique visual representations of various world philosophies are some of the features in Robert Kernodle's latest series of custom wall calendars for 2017. These calendars (just created as part of the series, Remarkable Wall Calendars) are now available for purchase at a well-known print-on-demand website. 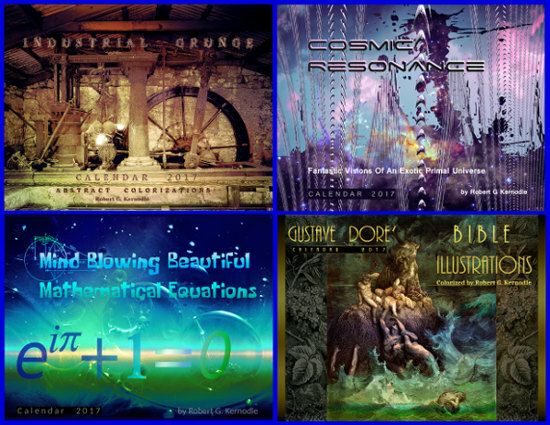 Kernodle's wall calendars include the following six new titles for 2017: "Alien Symphony", "Industrial Grunnge", "Gustave Dore Colorized Bible Illustrations", "Cosmic Resonance", "Mind-Blowing Beautiful Mathwematical Equations", and "Philosophy". Each 12-month calendar measures 14 inches wide and 22 inches long (unfolded), designed as a standard two-page piece, with spiral wire securely holding together twelve pages of sturdy, smooth card stock, featuring a full color illustration on each top page and a calendar grid on each bottom page. These wall calendars are not available in stores, since they are not published by mass-market calendar publishing companies that cater to large franchises or big box stores. Instead, these wall calnedars are designed for people who like something other than big-box store items hanging on their walls as organizers of the days and months of the year. With easy, secure, online ordering, these wall calendars are readily available to anybody, anywhere, anytime. Alternately, to inspect one of the specific titles of the calendars, use the search box at the given web address, typing in the specific calendar title along with the designer's name.